What’s in a name? When it comes to the internet, a website by any other name still puts content on the information superhighway. 🛣️ With so many websites out there, there needs to be a way to name them so we know which is which. Names for websites are called domain names and they live in the DNS, which stands for Domain Name System. The DNS acts like a big directory for all sites on the internet. The system consists of servers that index the human-friendly website domain names and translate them into a unique string of numbers called IP addresses, which identifies each computer on the Internet. This way, your website can communicate with your customers’ computers! 🤝 Whoohoo! But wait, there’s more! If you’re interested in drilling down even further, your domain's DNS is made up of many different types of records, including Address (A) records, Mail Exchange (MX) and Name Server (NS) records. A records are used to point a domain name or subdomain to a static IP address. An A record can only point to an IP address; it cannot point to another domain name. Volusion IP addresses are subject to change periodically. If your DNS is hosted with Volusion, the IP address on your A record will be updated automatically with no manual action required on your part. If your DNS is hosted externally, then you will need to update your A record to point at the new IP whenever it changes. MX (Mail Exchange) records are used to route email sent to your domain name. The Record Name field contains the domain name that appears in the email address. The Hostname field (or Data field) of an MX record contains the hostname of the server where mail should be delivered. In the hostname field, "10" represents the priority number for an MX record. Your current MX records may display as if they're written on the same line, but when entering a new one, you should always add it on its own separate line. You can specify a Priority when you set up an MX record to determine the order in which mail servers are tried. Email for Volusion stores is hosted with Rackspace, and the default Rackspace priorities are both 10. Other email hosts may have more than 2 MX records, or may have many different priorities to configure. You should check with the email provider for these settings. When listing the priority for a mail server, enter the priority number first, followed by a space, then the server name (See 'MX' Records section above for an example). You may have an extra MX record that points to mx1.emailsvr.com. This was used for email hosting transition several years ago, but is no longer used and can be ignored or deleted. A Name Server (NS) record is used to point a domain name at a name server, which maps human-recognizable identifiers (domain names) with numeric IP addresses. For Volusion stores, the four Volusion name servers are NS1.VOLUSION.COM, NS2.VOLUSION.COM, NS3.VOLUSION.COM, and NS4.VOLUSION.COM. They contain the information about the IP addresses for all Volusion stores. Once your domain's name servers are pointed at Volusion (and the changes have been updated across the internet, aka “propagated”), a customer can type your domain name into their browser, and the name servers will be queried about the IP location of your Volusion store. They will then match your store's domain name with its IP location so that the customer can see your storefront. All name server (NS) records must be edited from your domain registrar's platform; not from myVolusion. The name server fields are typically available within a section that contains all DNS records. If you're unable to locate these records within your domain registrar account, we recommend contacting your registrar for assistance or reading any available help resources to locate the information. The FTP record is used to set up an address for you to connect to when you want to transfer files to your domain using an FTP application or service. In most cases, there is no reason to change it from sftp.mydomain.com. The Mail record is used to give you access to the Volusion webmail service from webmail.mydomain.com. You can change the hostname here to assign webmail.mydomain.com to a third-party web mail provider if you wish. The WWW record is used to set up your domain alias. This cannot be edited. SPF (Sender Policy Framework) records are used as an email validation system. They filter spam by verifying sender IP addresses. Adding an SPF record allows domain administrators to specify which hosts are allowed to send mail from a given domain by creating a specific SPF record. Many mail services will check the SPF record to verify that mail from a given domain is being sent by a host that has been verified by the domain administrator. By having an SPF record, mail recipients can authorize which external hosts are permitted to use your name as the "MAIL FROM" identity during a mail transaction. Email marketing partners may want you to set up their hostname or IP address here. They should be able to tell you exactly what to enter here. For complete information see RFC 4408. Text (TXT) Records are used to store supplemental information (in ASCII text) about your domain. TXT records do not affect where your DNS is pointed, and are just a means to store information about your domain for future reference. Information that can be stored in a TXT record includes your administrator-authorized IP address and information about you, the domain owner. You will need to create a TXT record if you are setting up various Google accounts and need to verify site ownership. Full details, including the text that needs to be entered, will be provided by Google or whoever requests that you add this record. When entering an SPF or TXT record at myVolusion > Manage DNS, you must wrap all text in the Hostname field in quotation marks. For example, your SPF Hostname field should be entered as "v=spf1 include:emailsrvr.com include:smtp5.volusion.com ~all." Though DNS settings and changes can seem intimidating and a little scary, 😱 most of the time, you won’t need to worry about them at all. 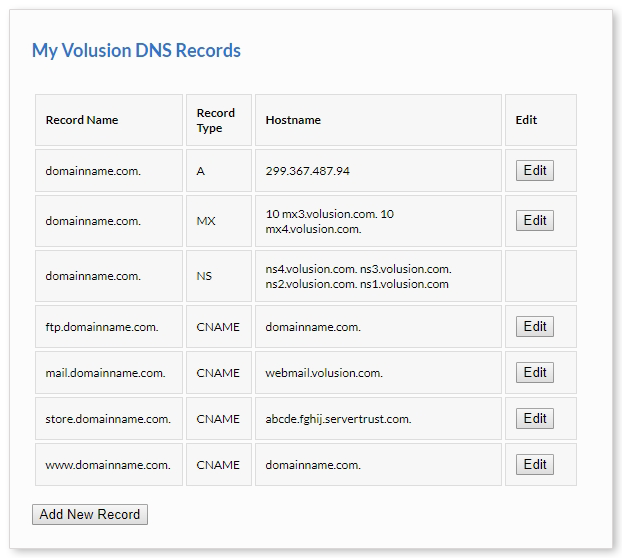 Volusion automates the process of pointing the records in your DNS for you. If you think you are having DNS issues, wait 24-72 hours (the time it takes for your site to propagate or “register” on the DNS) before attempting any troubleshooting.